In April 1861, a decade of rising sectional tension over the expansion of slavery and the balance of power between slave and free states erupted into a full-scale civil war when Confederate forces attacked the federal garrison at Fort Sumter, South Carolina. The ensuing four years tested the United States in ways never experienced before or since. The deadliest of all American wars, the Civil War cost more than 500,000 lives and left 400,000 wounded. In preserving the Union and ending slavery, the war expanded the meaning of freedom and equality. 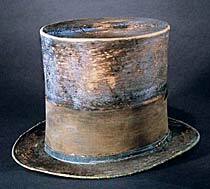 President Lincoln wore this top hat to Ford’s Theatre on April 14, 1865, the night he was assassinated by Confederate sympathizer John Wilkes Booth. In his struggle to preserve a divided nation and extend the founding ideals of freedom and equality, Lincoln confronted the most critical and difficult challenges ever faced by an American president. Widely criticized during his presidency for his management of the Civil War, after his death Lincoln became revered as a martyr and hero who saved the Union and abolished the evil of slavery. Confederate Maj. Gen. J. E. B. Stuart received this English-made Tranter revolver from Maj. Heros Von Borcke, a Prussian officer who served as Stuart’s chief of staff. The war’s most famous cavalryman, Jeb Stuart was renowned for his gallant battle charges and daring raids on Union forces. Also a skilled intelligence officer, Stuart was commended by Gen. Robert E. Lee as the “eyes of the army.” In May 1864, Stuart was mortally wounded in a battle with Gen. Philip Sheridan’s cavalry at Yellow Tavern, Virginia. On April 9, 1865, Gen. Robert E. Lee formally surrendered the Army of Northern Virginia to Gen. Ulysses S. Grant. Coming just days after the fall of Richmond, the Confederate capital, this event effectively brought the Civil War to an end. 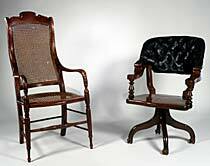 The two generals met at a private home in Appomattox Court House, Virginia, and sat in these chairs—Lee in the high-backed cane chair, Grant in the leather-backed one—as they finalized the terms of Lee’s surrender. The New Haven (Conn.) Arms Company presented this engraved, gold-mounted Henry rifle to President Abraham Lincoln in hopes that he would endorse the innovative firearm for use by the Union army. Designed by B. Tyler Henry, the .44-caliber, lever-action, repeating rifle fired up to seven times faster than single-shot muskets. Despite its technological advantages, it was deemed too heavy and damage-prone for regular battlefield use. After the Civil War, the Henry rifle was redesigned to create the famous 1866 Winchester rifle. 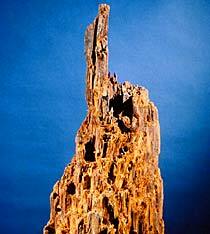 A mute testimony to the horrors of war, this shattered, bullet-riddled stump is all that remains of a large oak tree caught in the crossfire during one of the most ferocious battles of the Civil War. On May 12, 1864, Union forces launched a frontal assault on the entrenched Confederate defenses around Spotsylvania Court House, Virginia. Twenty hours of intense hand-to-hand combat ensued, leaving thousands dead or wounded. The site of the worst fighting, near where this tree fell, became known as the Bloody Angle. 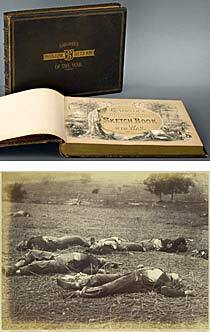 The first published collection of Civil War photographs, this two-volume set features the work of Alexander Gardner and ten other photographers who traveled to camps, forts, and battlefields to document the four-year conflict. In the 1860s, photo-illustrated books were expensive and painstaking to produce. Each volume of Gardner’s Sketch Book contains fifty original albumen prints, mounted on boards and bound together with the accompanying text. Because of low public demand, only about 200 sets were printed, making this a rare treasure of American photographic history.